Oconee County Commissioners will be asked again on Tuesday to decide if they want to replace Chuck Horton as one of two citizen alternates on the Hard Labor Creek Regional Reservoir Management Board and appoint instead the executive director of the Georgia Green Industry Association. The commissioners said at the beginning of the month that they expected that a special election to fill a vacancy on the Board of Commissioners would be settled by now, clarifying Horton’s eligibility for the spot. 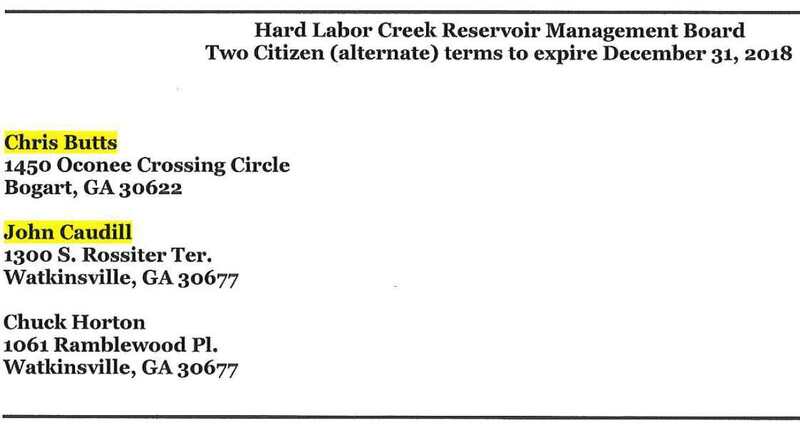 Horton is a candidate in that special election, and, were he to be elected, he would not be eligible to serve as a citizen representative on the reservoir management board. Horton won a plurality but not majority of the vote on Nov. 8, and he and Marcus Wiedower meet in a runoff election on Dec. 6. Early voting starts on Monday and will run through Friday at the Board of Elections and Registration Office across from the Courthouse. Also at its meeting on Tuesday, the Board of Commissioners will discuss amendments to the county’s alcoholic beverage ordinance and get an update on water and wastewater plans from Utility Department Director Wayne Haynie. 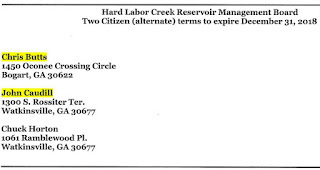 Horton and John Caudill both sought reappointment as citizen alternate members of the Hard Labor Creek Regional Reservoir Management Board. Both regularly attend meetings, though neither can vote unless the member for which they are an alternate misses the meeting. Horton earlier this year requested that the Management Board clarify the circumstances that would result in additional spending on a water treatment plant and distribution system given that neither county needs the water at present. The Board has not responded to that request. Horton lives at1061 Ramblewood Place, outside Watkinsville, and John Caudill lives at 1300 South Rossiter Terrace, also outside Watkinsville. Chris Butts, 1450 Oconee Crossings Circle, in the west of the county, has had no past involvement with the Hard Labor Creek reservoir, now filling in the south of Walton County. According to Butts’ LinkedIn page, since August of 2015 he has been executive director of the Georgia Green Industry Association, a statewide trade association for the horticulture and landscape industry. Butts has served as the county’s Citizens Advisory Committee on Recreational Affairs. Horton was the only one of the three applicants who appeared before the Board of Commissioners on Oct. 25 to take questions from the commissioners regarding his desire to continue as a designated citizen alternate on the reservoir board. Normally, the Board of Commissioners simply reappoints citizens who seek to continue to serve on committees. The commissioners went into executive session following that Oct. 25 meeting and agreed to replace Horton with Butts. The tradition is for commissioners to agree to be unanimous when they come back before the public in the next meeting to vote and not to reveal in public the reasons for the decisions. Though Commission Chairman Melvin Davis does not vote in regular sessions except in the case of a tie, he does participate in discussions of appointments in the executive sessions. The commissioners refer to the tablet screen in front of them in making their motions at that next meeting after the executive sessions. The names of the individuals that are to be appointed to the committee are highlighted on the document that appears on that screen. Through an open records request, I obtained a copy of the document on the tablet screen before the commissioners for the meeting on Nov. 1. The names of Butts and Caudill are highlighted on that document. Commissioner Jim Luke refused to go along with the decision when the commissioners at that Nov. 1 meeting. As Luke began to make a motion at that Nov. 1 meeting, Commissioner Mark Saxon interrupted and proposed that the commissioners go back into executive session to discuss the disagreement. The group huddled again in executive session at the end of that meeting on Nov. 1 and then came back into open meeting to announce that the Board would not make a decision until Tuesday night. While no one offered an explanation of that decision, Luke and Saxon told me subsequently that the two of them were hoping the issue would be resolved by the Nov. 8 election. The commissioners are scheduled to consider on Tuesday a draft revision to the county’s Ordinance Regulating the Sale of Alcoholic Beverages that would allow for Sunday sale of beer and wine in grocery and convenience stores and Sunday sale of alcoholic beverages in restaurants. Voters overwhelming approved Sunday sales on Nov. 8, allowing the Commission to revise its existing ordinance, which currently prohibits Sunday sales. The draft ordinance before the Commission on Tuesday would allow the sale of beer and wine in grocery and convenience stores from 7 a.m. and 11:59 p.m., Monday through Saturday, and from 12:30 p.m. to 11:59 p.m. on Sundays. Restaurants would be allowed to sell alcoholic drinks between 11:30 a.m. and 11 p.m. Monday through Saturday and between the hours of 12:30 p.m. and 11:59 p.m. on Sundays. If the Commission gives the first reading of the ordinance on Tuesday night and approves it after a second reading on Dec. 6, the changes could be effective immediately. That would mean that county grocery and convenience stores and county restaurants could sell on Sundays during the upcoming holiday season. The draft ordinance does prohibit the sale of alcoholic beverages on Christmas Day. Sales would be allowed until 12:30 a.m. on New Year’s Day. The draft agenda on the county web site gives no information on Utility Department Director Haynie’s report on water and sewer issues. I sent Haynie an email message today (Saturday) asking for details. I did not receive a reply. Haynie has a wide range of water and sewer projects in the works or under consideration, including the possibility of running a sewer line down Calls Creek to accommodate expansion of the Calls Creek wastewater treatment plant. Since when is it legal to go into Ex Session to discuss an appointment to a board or to solve a 'disagreement'?????? This is ludicrious! !